Not only has 2015 moved by fast but the real estate market is moving at a record pace. Toronto Real Estate Board President Mark McLean announced that Greater Toronto Area REALTORS® reported 7,385 home sales through TREB’s MLS® System in November 2015 – up by 14 per cent compared to November 2014. This result regarding real estate in Toronto also represented the best result on record for the month of November. Sales through the first eleven months of 2015 amounted to 96,401. Although the total numbers are up in the GTA there is a shortage of good properties in many of the central Toronto neighbourhoods that we work and you live. Prices are up as well. The MLS® Home Price Index (HPI) Composite Benchmark was up by 10.3 per cent year over year in November. 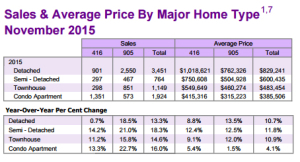 The average selling price for all transactions was also up by a similar annual rate of 9.6 per cent to $632,685. Annual rates of average price growth for November and the first eleven months of 2015 were similar, with the strongest rates of increase being reported for low-rise home types, including detached and semi-detached houses and townhouses. With prices up and supply limited in many of your neighbourhoods, if you are contemplating a sale it may be a good time to beat the spring market and take advantage of the market conditions. We have a great new app that you can download and keep up to date on all the properties for sale or rent, that you can browse with your smartphone or tablet. Alternatively, you can email us and we will send you the link with instructions on how to use it. It is a great way to see what your neighbours are asking for their home. Regardless, we are always here if you have any concerns, questions regarding real estate or you just need a friend to chat with. On a personal note we are all looking forward to spending Christmas with our families in the city. As always we remain, your Real Estate Consultants…For Life! The very best to you and yours. Happy Holidays!